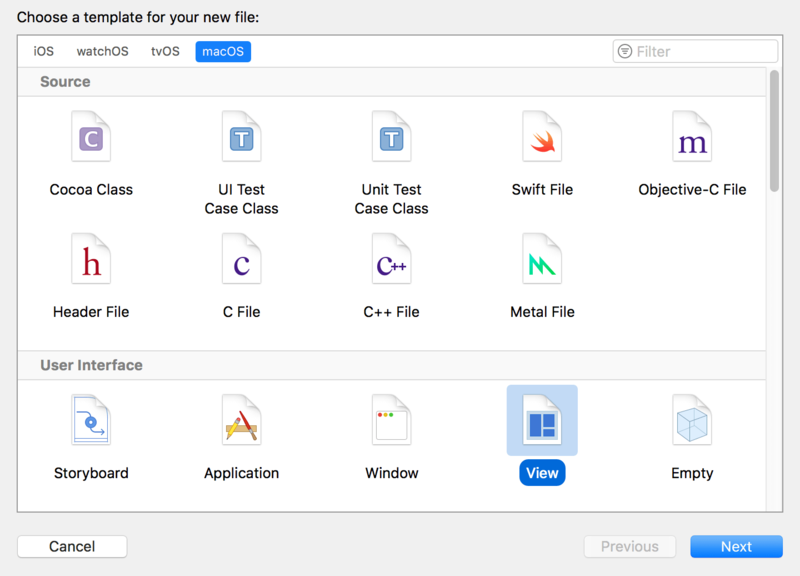 Welcome to my second tutorial of the macOS app development! If you have not read my first tutorial on macOS app development, it may be helpful for you to check it out first as I will not go into some of the stuff, which were already mentioned there. 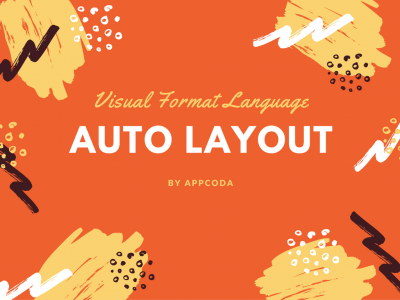 In this tutorial, we will be looking into custom views, audio playback and one of the most commonly used feature: File Upload!. As you can see from the demo above, the app is very simple. 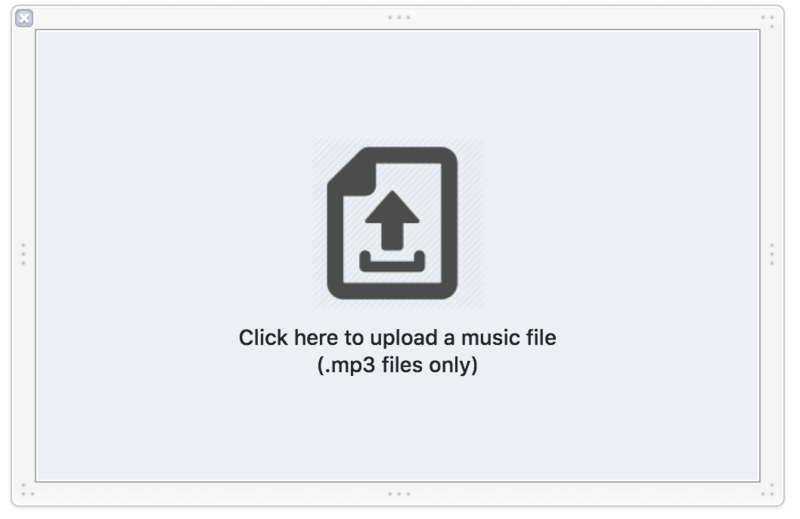 The user will first be presented with a home screen with instruction saying, “Click here to upload a music file (.mp3 files only).” Next, the user can click to upload any mp3 format audio files to the app. It will then present the next screen, which is a screen for the user to pick the number of repeats. 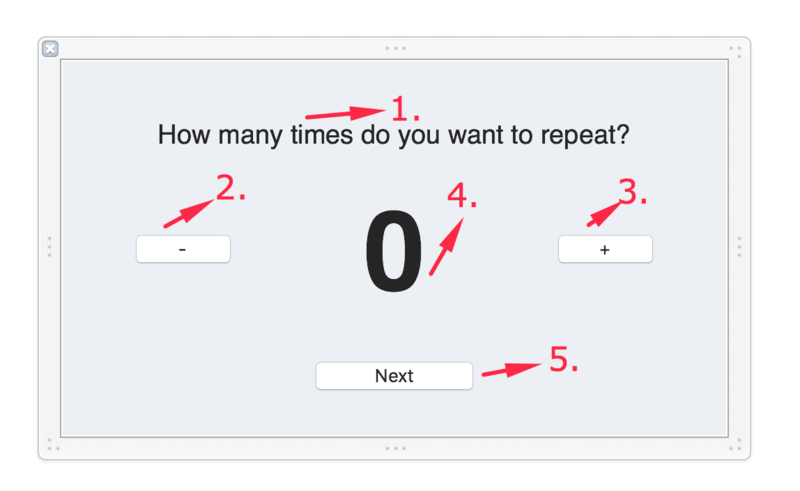 Once the number of repeats is confirmed, the user are able to hit Next. They will be presented with the Playing screen which will be shown till the app has finished playing the music playback. Enough of talking, let’s get started! 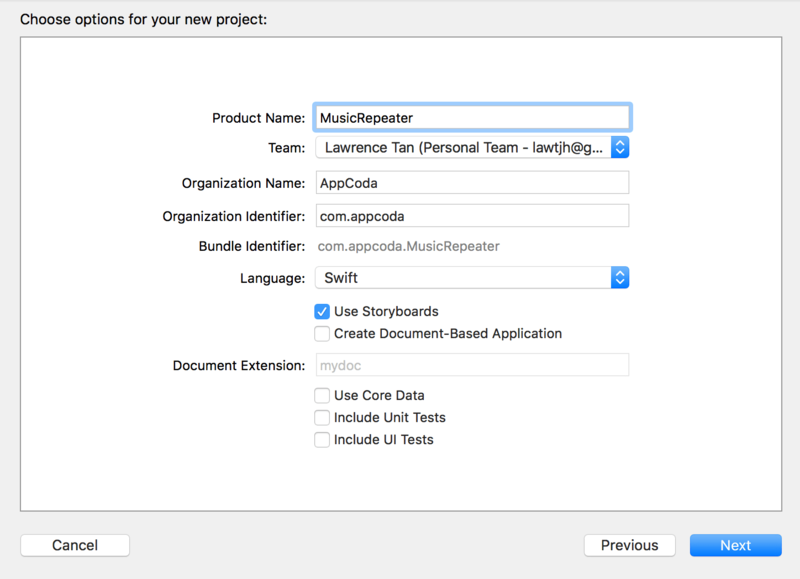 First, let’s launch Xcode 9 and create a new macOS app project named MusicRepeater. Choose macOS and Cocoa App under Application. You can follow the settings I put in the next page as follow, then choose a directory of your choice for the project files. 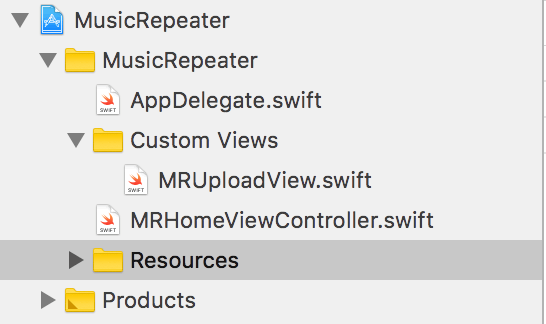 Now that you have the project setup, let’s rename the default ViewController as HomeViewController using Xcode’s Refactor function. Head over to ViewController.swift, highlight the class name then go to Toolbar -> Editor -> Refactor -> Rename and let’s call it MRHomeViewController, this name is more explicit. MR stands for the initials of the app we are making. As a software developers, we will work with projects that may involve many other frameworks, putting a prefix (i.e. like initials of our app name) helps us identify which viewcontroller is localized to our app. You can download the upload image icon I use here. Once you have the asset, drag it into Assets.xcassets and rename it to imageUpload. Also, move the asset to 2x. Next, we will create the custom view class & nib. In a nutshell, NSNib is like an unpacked object of the XML Interface Builder file (XIB). Now, do not be confused with XIB & NIB. NIB works closely with the XIB file to re-establish all related IBOutlet connections so that when you create a custom view object from the Nib, all the connections are retained. Now, let’s start by creating our first custom view called MRUploadView. 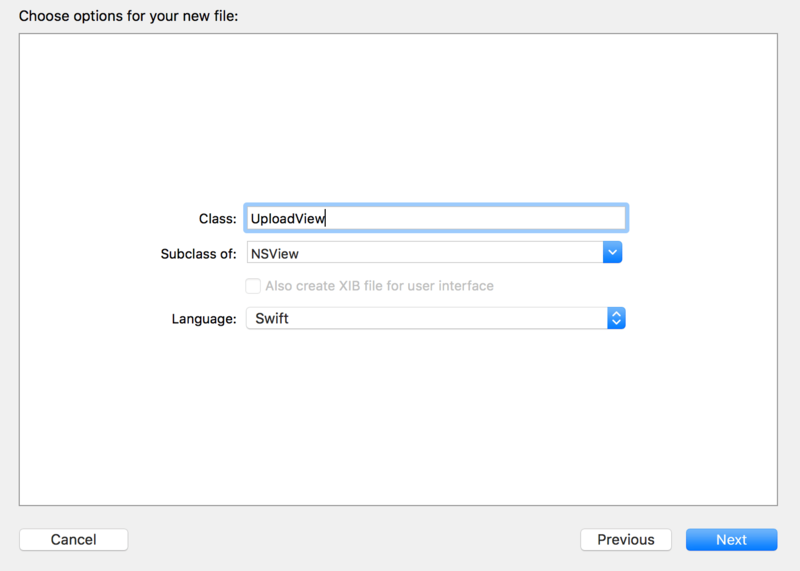 Go to File -> New -> File -> Cocoa Class and ensure that the Subclass is set to NSView. To keep our project directory more organized, create a new group in our project navigator and name it Custom Views. We can also shift AppDelegate.swift to the top and you should have a more tidied up project navigator like this! Now that we have the View class, we will now create a XIB file, so that we can edit the view easily using Interface Builder. To better organize the project, let’s put all our custom view related files in the newly created Custom Views folder. So go ahead, right click on Custom Views folder and go to New File. Go all the way down and find View. Name it the same as the custom view class MRUploadView.Xib. Apparently, the XIB view needs a class owner, so set the class as MRUploadView, and we can be off to load it into MRHomeViewController! Be sure to get familiarised with all these steps as I will be skipping the details for the next 2 custom views. Phew! You did a great job coming this far. We are ready to start coding! Let’s start by adding two IBOutlets to our UploadView. @IBOutlet weak var uploadButton: NSButton! @IBOutlet weak var staticLabel: NSTextField! Drag the two IBOutlets and connect them in our Xib. Now that we have our view wired up, let’s load it into MRHomeViewController. Here we are initialising a new NSNib object from our Xib file. As our Xib file is in the main bundle, there is no need to specify any bundle here. Next, we declare an array of objects to store the view objects contained in the Xib file. Taking a look at the instantiate method, we set the nib’s owner as self which is our MRHomeViewController, and there is another unfamiliar parameter that the method is taking in, its call AutoreleasingUnsafeMutablePointer. One good thing about such parameter is that once the method ends, the reference to the objects variable will be gone, freeing up memory. We have to prefix our parameter with & because it’s also an inout parameter, whenever our objects is modified, it will affect the passed-in parameter too. Phew, that was quite a mouthful! Now, here’s something lighter, we loop through the objects found in the Xib and search for the MRUploadView object. Once found, return it to the uploadView variable. If nothing is found, we will just create a new MRUploadView object. Upon calling uploadView, we have actually initialised the view object, so here we set the frame to be the same as our window size and add it as the subview. Verify the value of the CODE_SIGN_ENTITLEMENTS build setting for target "MusicRepeater" and build configuration "Debug" is correct and that the file exists on disk. 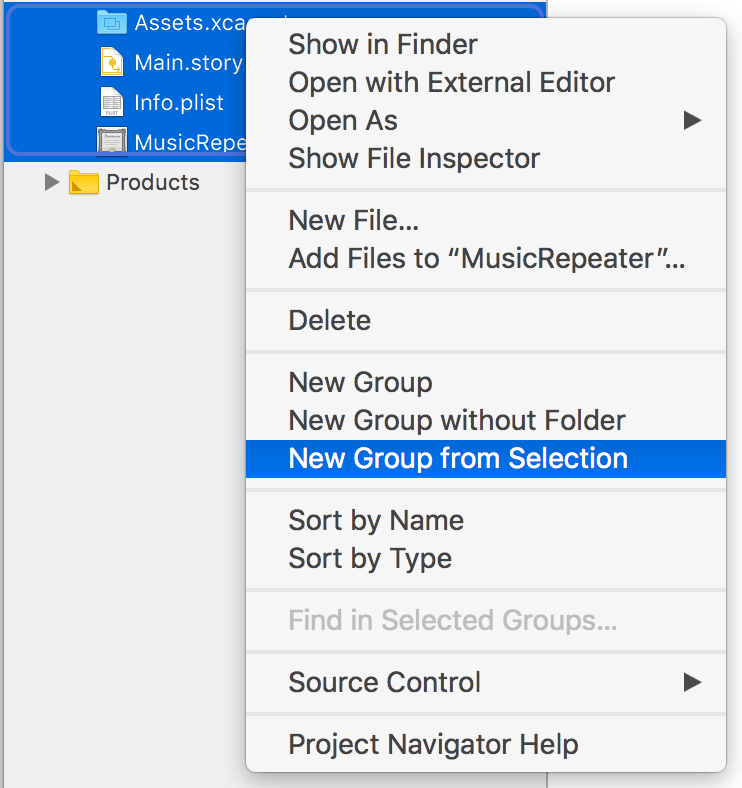 When we organized our files just now, Xcode actually created a new folder named Resources and placed the files inside the folder. This is the reason why the error above appeared. Let’s fix it. First, go to the Project’s Build Settings, search for entitlements and add the path to the Resources. If you also encounter issue with Info.plist, just click the find file and navigate to the file itself to fix it. Try running the app again and you should see your upload view! You should have created a method like this after the IBOutlet connection. We want to open up our system file uploader when this button is clicked. So here, let’s use our simple Delegate Pattern again to establish a communication between our Upload View and our View Controller. Try doing a build project, everything should still work as normal. Here, we will introduce another new member of macOS AppKit called NSOpenPanel. In simple words, calling the methods from this class will trigger a call to system file panel. Note: Here, you may encounter an error where Xcode wants you to force unwrap the delegate. This is because we have not set our view controller to implement to the protocol object. We will do it next. Here we initialised a new NSOpenPanel object. We then call its begin method which is a superclass method from NSSavePanel. 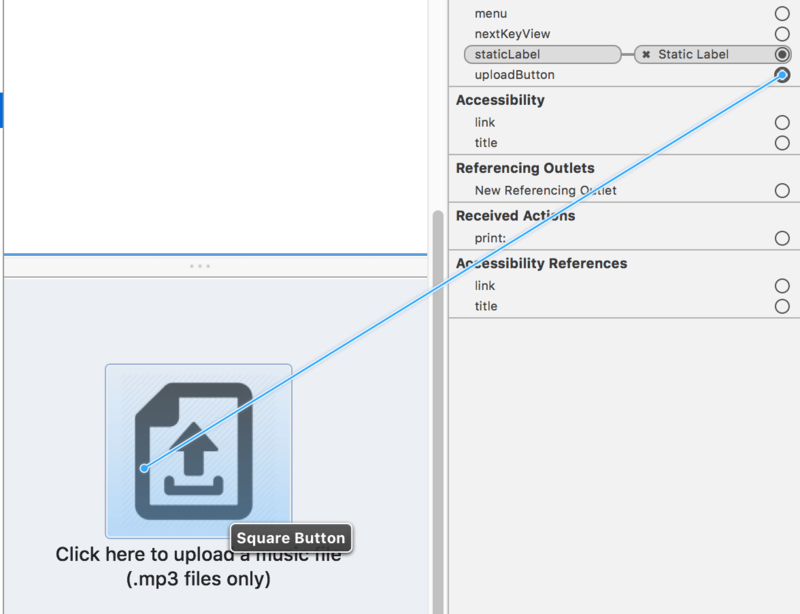 This will present a modal view of our system file panel to load in a .mp3 file. The response parameter of the closure is an enum of NSApplication.ModalResponse. We used a guard statement to handle the response and verify if the .mp3 file is valid. We will connect the dots later as we implement of next step. Go ahead, run the app and try loading your non-mp3 and mp3 files! Good job so far! From here and onwards, I will go rather fast as I will not be covering in-depth on stuffs we have covered in the previous tutorial. If you are stuck at any point, try to get the finished project at the end of the tutorial for reference. Happy Coding! Welcome to the second part of our MusicRepeater App! We are now going to create our repeater view, users will be brought to this view once a valid .mp3 audio file is uploaded to the app. @IBOutlet weak var numberLabel: NSTextField! Remember to put everything inside the Custom Views folder! We will also want to remove the draw method and replace it with awakeFromNib method. Everytime when we unarchive our view from the xib file, a message will be sent to this class. Then this method will be called, so it will be a good place for us to do some initialisation later on. Next, we are going to add the logic of the Add and Subtract buttons. Let’s first declare a local variable to keep track of the currentCount. Because we will be calling self here, it is recommend to use weak or unowned here to prevent Strong Reference Cycle. Now, go ahead and run the app, upload a valid .mp3 file. You should see the second screen! If you try the Add and Subtract features, you may have noticed some UI issue, and that the number goes below 0. Logically, the repeat feature won’t work by having a negative value. We will fix the UI at the end of the tutorial. Now let’s fix the negative value first. One of the most beautiful things that Swift offers is the ability to easily extend the existing type (e.g. Int), even for the types provided by the iOS SDK. We are going to add an add() function and a subtract() function for the built-in Int type. As we need to mutate the properties of our Int, we will need to add the mutating keyword. For the rest of the code, it is pretty straightforward. In particular, the subtract method performs an additional checking to verify if the existing number is valid for subtraction. Run the app and it should work as expected! Just like what we did previously, we will be adding a delegate to MRRepeaterView, so that MRHomeViewController knows when to show the PlayingView. We will also need to set our delegate in the showStep2() function. Now we are ready to go to our final section. Give yourself a pat for coming this far! Just one more lap to go! 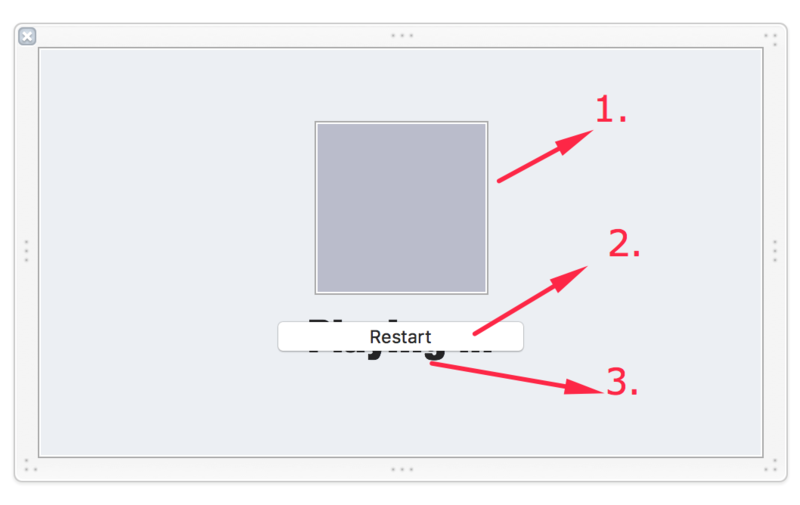 @IBOutlet weak var restartButton: NSButtonCell! As we are adding our views in our Step2 and Step3 functions, we should call removeFromSuperview() instead of hiding it. You can now run the app and see the progress you have achieved so far! We are missing one very important puzzle piece here, the AudioPlayer! Without it, the app can’t perform audio playback. We will use an open source library called AudioPlayer which wraps over the built-in AVPlayer to manage audio playback. You can install the library up to your likings, personally I prefer to use Carthage. Of course, you can also use CocoaPods. For Carthage installation, just add github "delannoyk/AudioPlayer" to a new CartFile.private and run carthage update. Then, drag the framework in and add a Copy Files phase. Okay, here is the list of things you need to do in order to use AudioPlayer for audio playback. First, we need to create an array of AudioItem because we will be passing in this array to our audioPlayer to loop through and play. We also set our audioPlayer‘s delegate. Next, we validate that we have a valid URL. Based on the count that was set in step 2, we create a new AudioItem object and add it into an array. After the loop, we call playMusic with the play list. The AVPlayer will handle all the playing processes. As you can see, what you need is to prepare the list of audio objects. 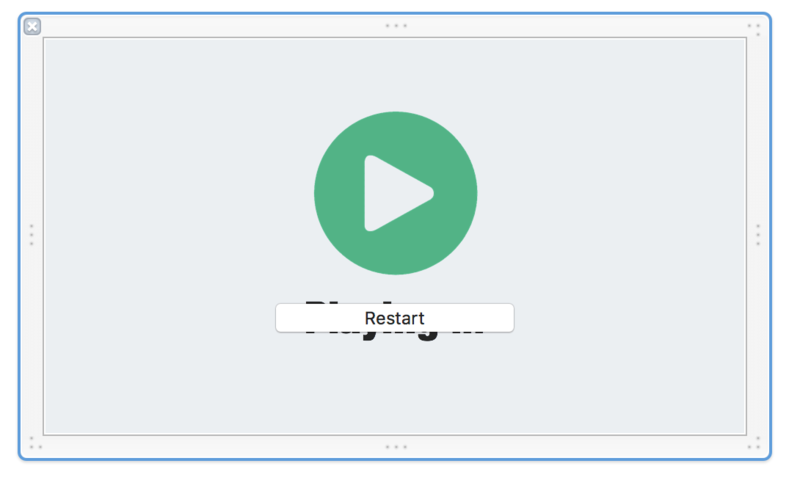 For the restart method, which is called when someone clicks the Restart button, we stop the audio player to interrupt the music playback. 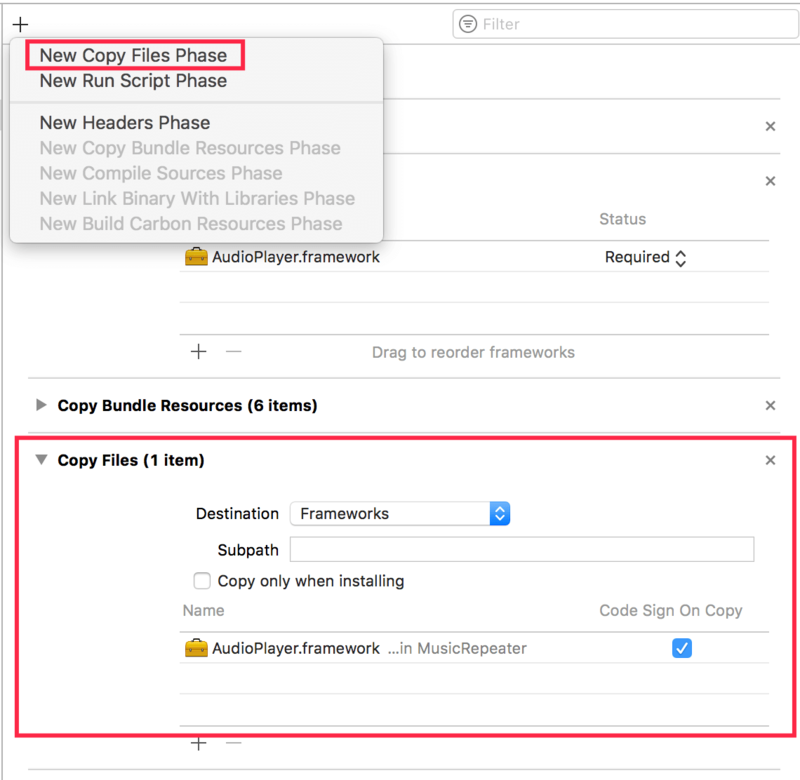 Finally, we implement AudioPlayerDelegate method as below to update the static label when the audio has reached the end of the playlist. That’s it! 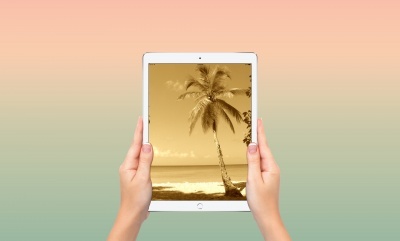 Now go ahead and enjoy your MusicRepeater App! Thank you for following me till the end of my second macOS tutorial! We’ve achieved a lot of stuff in this tutorial. 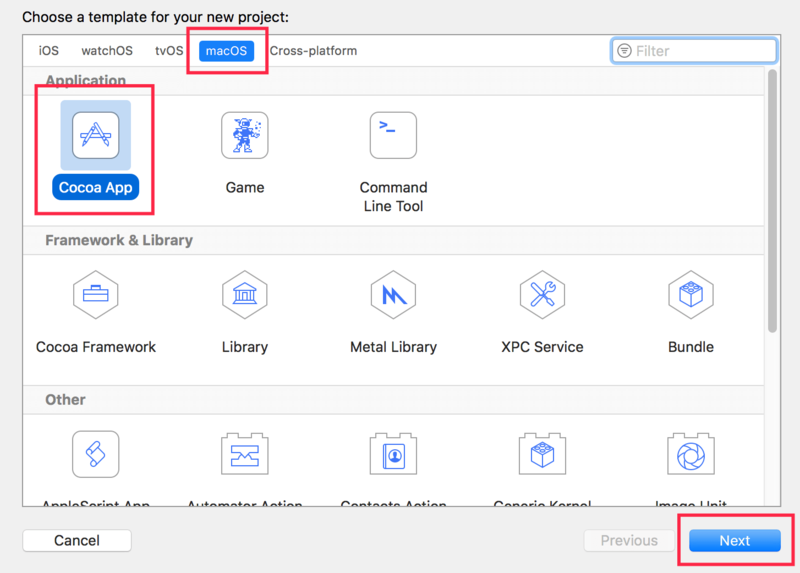 You should learn how to build a macOS app from scratch and understand how to use various APIs for music playback and file upload. I really hope you enjoy the tutorial. If you have any tutorial ideas that you want to request, feel free to drop me a comment or message and I will try my best to meet your needs. Just wondering, how much does it cost to create a simple iOS app? 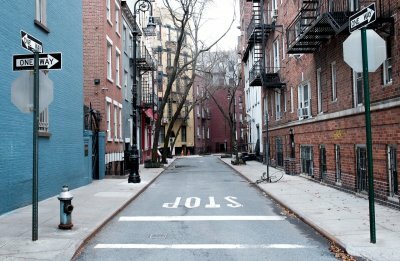 Hi Emily, it is typically hard to estimate cost of development without timeframe and details. Usually it can cost between $50-$1,000 for serverless app or over $1,000 for more complex apps.